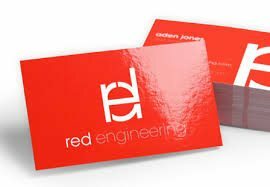 The perfect business card should convey a sense of what your business is about while also providing useful information about your company and your role in it. Although there is a limited surface area, by using the space wisely, you will give people more than just your name and address when you hand them your card. In this article, we’ll cover 7 steps to get business cards that are just right for your business. If you’re looking for an affordable way to print beautiful, professional business cards, check out Vistaprint. 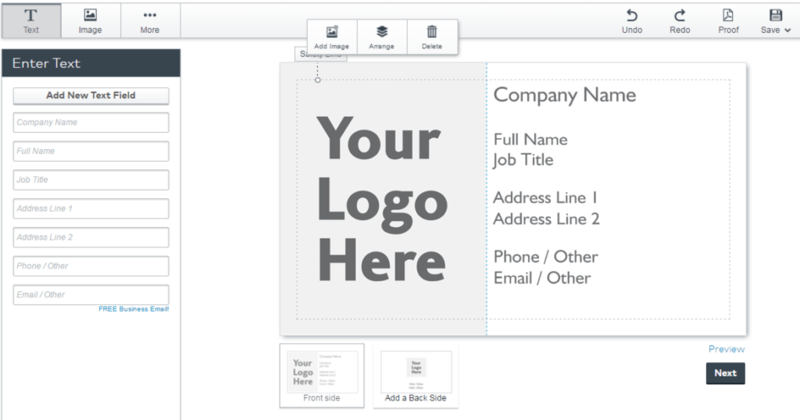 There you can choose from over 10,000 business card templates or upload your own design. Prices start at 500 cards for $9.99 with free standard shipping. Click below for current promotions. Order from an online printer – This is the option we recommend because it’s super easy to use online printers (we recommend Vistaprint), and the cards end up looking very professional. The cost also ends up being less than printing the cards yourself once you add up the cost of the printer, ink, and paper. Work with your local printer – This is probably the most costly option, but you will also get the most personalized help here. Do it yourself – We don’t recommend this option because unless you are a professional designer and have a really good quality printer, the business cards are not going to look good. However, if you want to have a crack at it, there are free templates online, and you can buy business card paper here. You will need a high-quality inkjet or laser printer. Once you decide where you want to get your business cards made, you can start designing your business cards. There are a few decisions that need to be made when it comes to choosing the type of business card that you want. Business cards range from classically simple to flashy and fun, so you need to know what impression you want to make in order to choose which options will work for you. When choosing your paper finish, most business card companies offer the option of glossy or matte. Both options look good, so it is primarily a question of personal preference when deciding which option to go with. The glossy finish has a gloss coating applied to the business cards that creates a shiny and flashy look. This option is recommended if you have an image or lots of color on your business cards, as it makes these elements pop. The matte finish has a dull coating applied to the business cards that creates a protective, non-shiny look. This option is great for a more classic feel and is recommended for designs that are text heavy. We use a matte finish for our business cards here at Fit Small Business. Another significant difference is that the glossy finish is harder to write on than the matte finish. This becomes a problem if you are likely to hand out your card at events such as trade shows or networking events. Since you are meeting a ton of people in a short amount of time, many people use the practice of taking notes on the back of business cards in order to remember the conversation. If people can’t write on your cards, it could hurt your chances that they’ll remember you. Standard – This option is the least expensive, but it is also pretty flimsy. Signature – The middle option provides a good thickness and only costs about $8 more than the standard option. Ultra thick – The thickest option is very sturdy. The downside is it could be too thick to fit into standard business card holders. While it’s tempting to go with the least expensive option, if there is one place a small amount of money can make a big difference with the business card, it’s with thicker paper stock. We recommend going with the signature option (or 115 lb, 16 pt card stock). Added expense – Having a business card with rounded corners or with a unique shape will cost you extra. Easier to lose – Most people keep business cards in their wallets or in a rolodex to keep track of cards they’ve received. If your card is oddly shaped or made of a thicker material (such as wood or metal), it’s possible that it won’t fit nicely into places where people usually keep cards. If you can afford the added expense, having a unique business card is a great conversation piece when you are meeting someone for the first time. However, we recommend keeping it the standard business card size (3.5” x 2”) to keep it from being easily misplaced. Your business name – If you are just starting your business and haven’t come up with a name yet, view our article on choosing a business name. Your job title – Learn how to come up with job titles in our article. Telephone number – Learn how to choose between a local number, 800 number, or vanity number for you business card. Email address – Make sure you’re not using a personal email address on your business card. Learn how to set up a business email address for free. 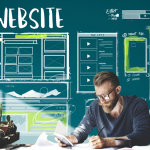 Website – Putting a website on your business card will let people learn more about your company after you’ve handed them your card. If you haven’t set up a website yet, learn how to create one for just $3.45/month or less. Your logo – Whenever possible, you want to keep your branding the same online and off. If you don’t have a logo yet, view our comparison of the best logo design services. Your physical address – If you have a local business with a physical presence then adding your location information is a no brainer. 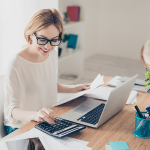 If you operate 100% online however, you may consider using a virtual office to make your business seem more professional. Company tagline – Consider adding a short sentence which lets customers know that your business is the one for the job (read this article by James Chartrand for more on taglines). Social media accounts – This refers to your Facebook page or your Twitter handle. Your picture – If you operate in a line of business like real estate or insurance sales where you and your business are one and the same, then using your picture is not a bad idea. Need a new headshot? Read our guide for tips on how to get the perfect headshot. QR code – You can use this so people can scan your card with their phone and have your contact details automatically added to their contact list. For more on this go here. Professional Certifications – For professions such as realtors or lawyers, you may want to include your certifications after your name. View our article on real estate designations to learn more. Remember that there is a limited amount of space, and you don’t want to cram all of this information on your business card. Choose the information that is most relevant for your type of business to highlight. Use a premade template – This is the cheapest and easiest option. If you decide to order your cards through an online printing company like Vistaprint, they will have templates that you can customize with your company’s information. Design yourself – If you know how to create custom designs, then you can choose to design your own business cards. Hire a professional designer – You can hire someone to create a custom design for as little as $5 on Fiverr. If you are willing to pay more, 99designs connects you with professional designers. You can expect to pay $449 for custom business cards. Work with the printing company directly – Some printing companies offer design services. The cost for this is generally somewhere between $100-$500. We recommend using a premade template as this is free to do, and the templates can be customized with your company’s logo and information. Remember that readability is the most important thing when choosing your font, so you want to avoid decorative fonts. We use Copperplate Gothic for our cards. Here is a list of fonts from Prepressure.com that generally look good in print. If you use more than one font on the card then it should be complimentary and it is not recommended to use more than two. Remember that you can use different sizes and bolding to make the important areas, like your business name stand out. When in doubt, use the default font that is in the template you are choosing. If you are using Vistaprint, then you can very easily upload an image file of your logo and crop it so it will fit in the area reserved for logo. This of course assumes that you have decided to use your logo on your card, which is generally recommended. The template should also allow you to easily select the text areas that you want to edit and change things like colors and fonts using a menu. If you don’t want a specific piece of info that the template has space reserved for, you can very easily delete things as well. Don’t have a logo? There are many choices for logo creation! You can run a logo design contest for a few hundred dollars or for $5 get a designer from Fiverr to create a logo. At this stage you should have everything set and be ready to order your cards! 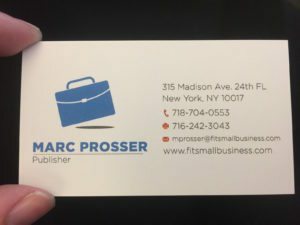 We’ve used Vistaprint for years to print our own business cards. We choose a simple, professional design, and good quality paper, and pricing is very affordable. With Vistaprint, you can get 500 cards for $9.99 with free standard shipping. If you want to have something else printed on the back of the card or choose the premium matte stock paper, which is what we use, it will cost a little extra. All in all, you can get a nice set of cards with Vistaprint for less than $25. Click here for current promotions. The perfect business cards should be affordable, well designed, and reflective of your business. If you need some inspiration to help you create your business cards, check out these business cards that we love. Thanks for sharing this information. Business cards are the best way to set a first impression in the minds of your clients. These cards will provide them with a basic and initial information about our business. Sure thing thanks for reading and for the comment!